Hi guys! These are my ear-piercings. But I also got a new ear piercing! 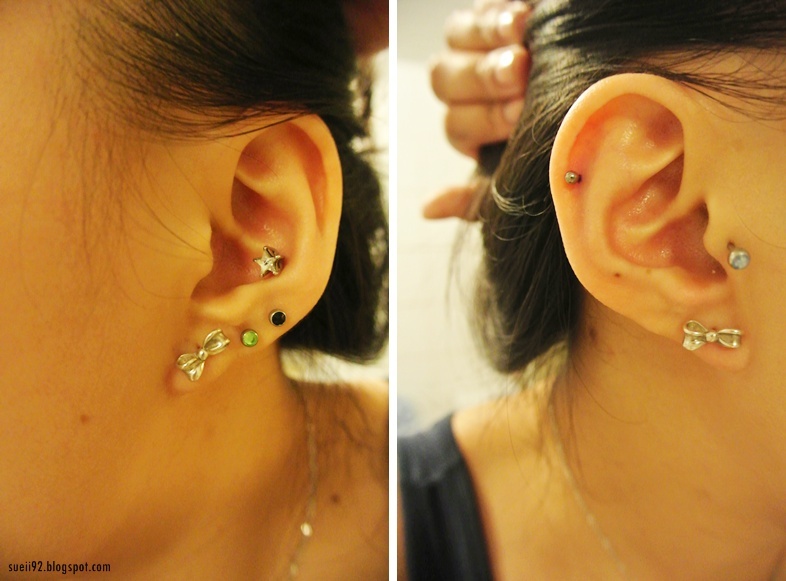 The helix piercing is on the second picture on the upper left side of my ear. I really wanted for a long time, but couldn't do it because I haven't asked my internship mentor if ear-piercing were okay. A few days agoday I went to the company to complete the contracts and got the permission. On the same day I went with my boyfriend to get my (last) ear-piercing in The Hague. What do you think? Do you also have piercings? What do you think of piercings in general? I personally love ear-piercings, but I wouldn't pierce other parts of my body. That's so many piercings O: They look lovely though!